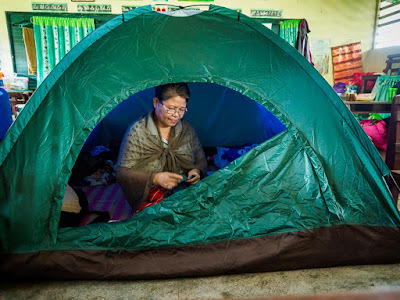 A woman sorts her clothing in the tent she sleeps in in a classroom at the school she is sheltering in during the eruption of the Mayon volcano. She said she's staying in the tent of because the roof of the classroom leaks. 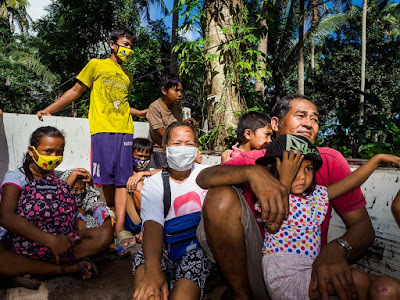 I think the important story at this point in the volcano's eruption is the developing humanitarian crisis in Albay province. Evacuations of communities on the slope of the volcano started around the 15th of January. Althought exact numbers fluctuate, the provincial disaster mitigation office said about 27,000 people were evacuated in the first week. In the days since the large eruptions of January 22, an additional 52,000 people have been evacuated. In total, more than 80,000 people have been evacuated from the mountain. 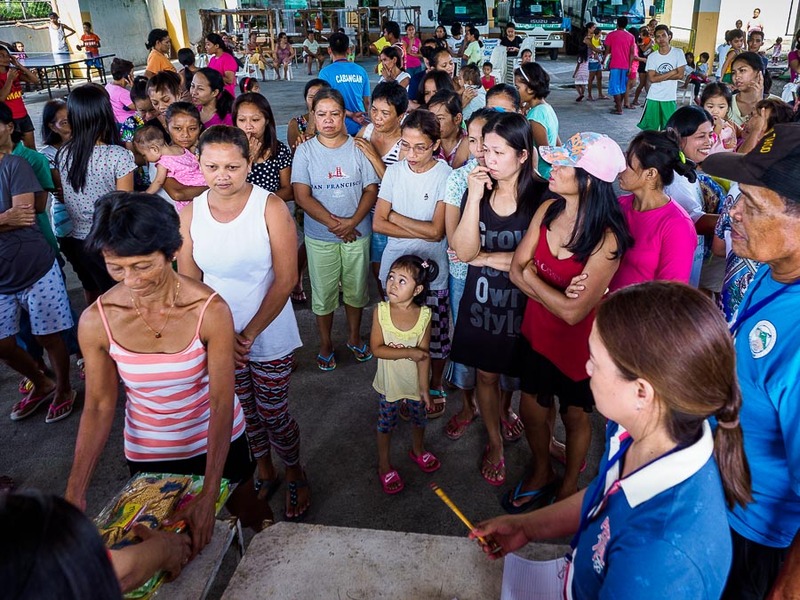 Evacuees at a shelter in Camalig line up for supplies, including mosquito nets. This photo was made before the eruption of January 22. These people have been re-evacuated to another shelter further from the volcano. The government has done an impressive job of moving people out of harm's way. Government agencies that monitor the volcano issue a constant stream of alerts, local media reports on every development on the mountain and people are responsive to the news. Government trucks started moving people out of the expanded evacuation zone hours after it was expanded following the January 22 eruption. Evacuees in the back of a government truck leave their homes following an eruption. 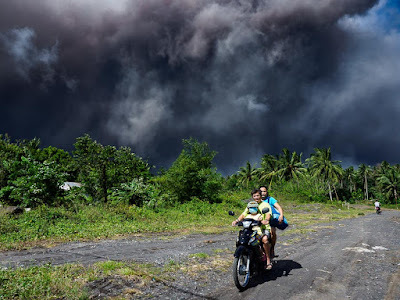 An ash cloud passes over the country side as people self evacuate after the large eruption on January 22. Now the schools are full. But the volcano is still erupting and the evacuation zones are expanding. The government is making plans for mass evacuations by sea in the event of a cataclysmic eruption. People are sleeping in the open in impromptu camps set up along the highways. 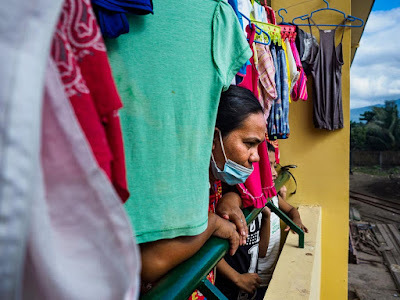 Because of the volcano's volatility, the government is making plans to house people for up to three months. 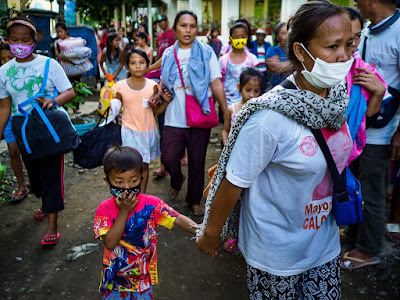 Evacuees arrive at a shelter. 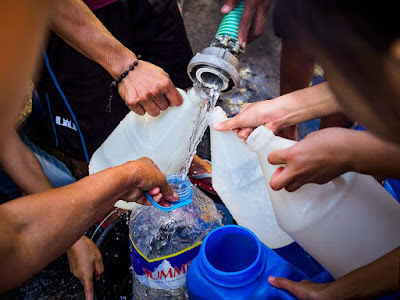 Getting drinking water at a shelter in Ligao. 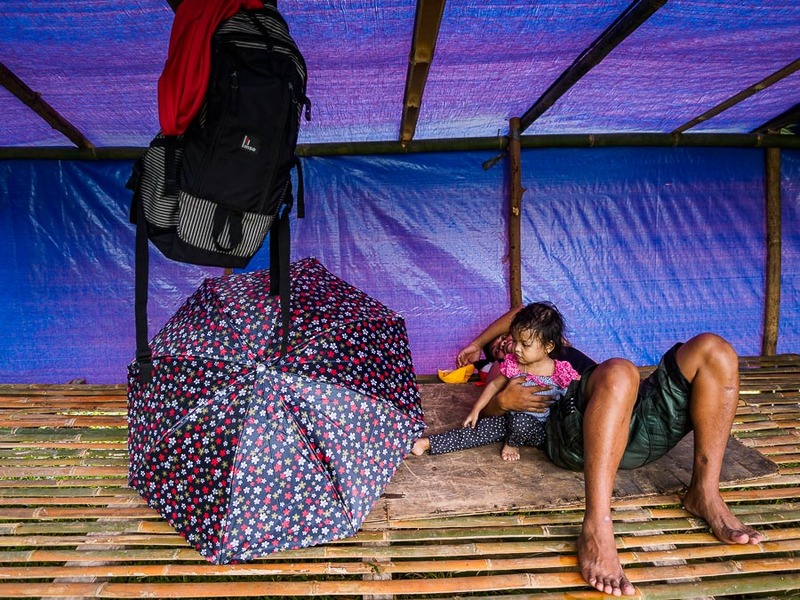 A man and his daughter in a temporary shelter on the side of a road in Santo Domingo. 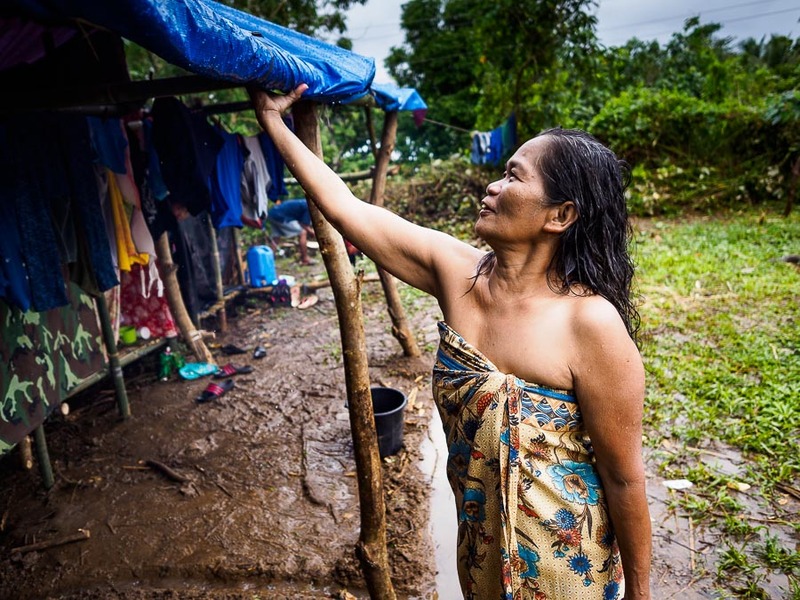 A woman knocks the water off the roof of her temporary shelter after a rain. She's living in a clearing on the side of the road. 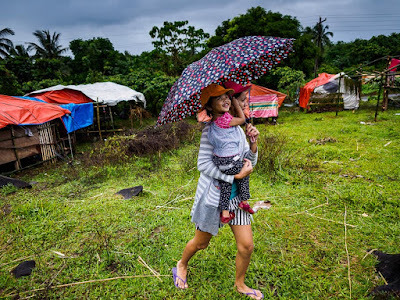 A woman and her daughter walk through the clearing that is becoming an impromptu shelter for people leaving the mountain. Life is not easy in the shelters. There are 25 - 50 people sleeping in each classroom. People are cooking in the rooms, in the halls, where ever they can find space. The rooms are hot, noisy and crowded. That's one reason some people are sleeping rough on the side of the road. It's not as confining. 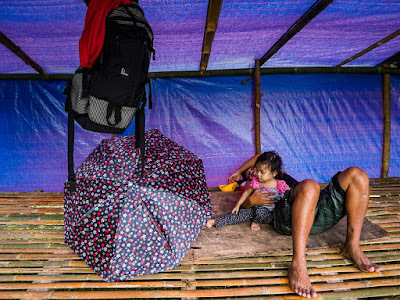 On the other hand, it's been raining a lot this week and the people living in the impromptu shelters in the forest are basically living in mud bogs. Everything is soaking wet. And nothing will dry out until it stops raining. Some of the schools are so crowded people are building thatched huts and tents in courtyards and sports fields on the school grounds. A man digs a drainage ditch between tents at a shelter in a school in Santo Domingo. It's easy to see how keeping 80,000 people in shelters, away from their homes, their livestock and their farms for 90 days could lead to a crisis. 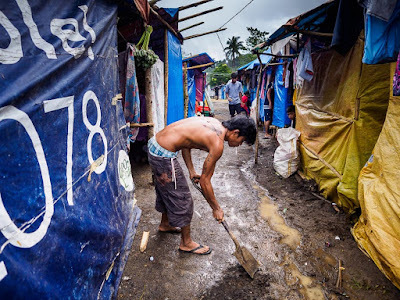 The government has to provide food, water and medical care for 80,000 people for 90 days. In that time, hundreds of babies will be born. And hundreds of people will die of natural causes. Thousands of children will see their education disrupted. A woman who is 8+ months pregnant in her tent in Santo Domingo. She said she expects to give birth in the next couple of weeks. Which, more than likely, means she will give birth in the camp. I talked to government officials and local elected officials. They've been upbeat about the task they face. But that was before the numbers swelled to 80,000 and timeline expanded to 90 days. 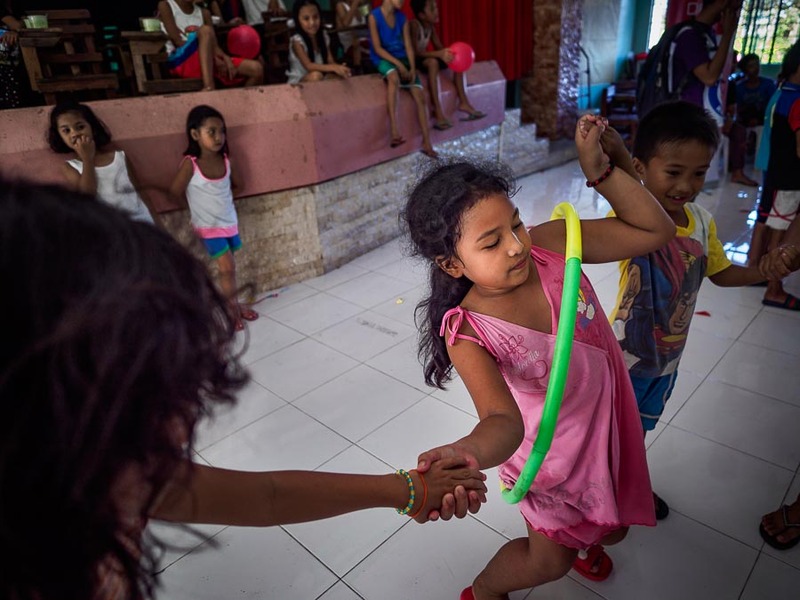 Children in an evacuation center play games with a hula hoop. The event was organized by the Philippine Red Cross. A woman in an evacuation center in Ligao looks out at the school courtyard. Her laundry is hanging around her. No one knows how this is going to end. It would be great if the mountain stopped erupting and went back down to a level 2 or even 1 and people could go home. But PHILVolcs (the government agency that monitors the volcano) said only about 30% of the magma has been discharged and pressure is still building inside the volcano. People can't go home under those circumstances. Soon pressure will also be building in the evacuation centers. There are more photos of the evacuees in my archive or available from ZUMA Press.